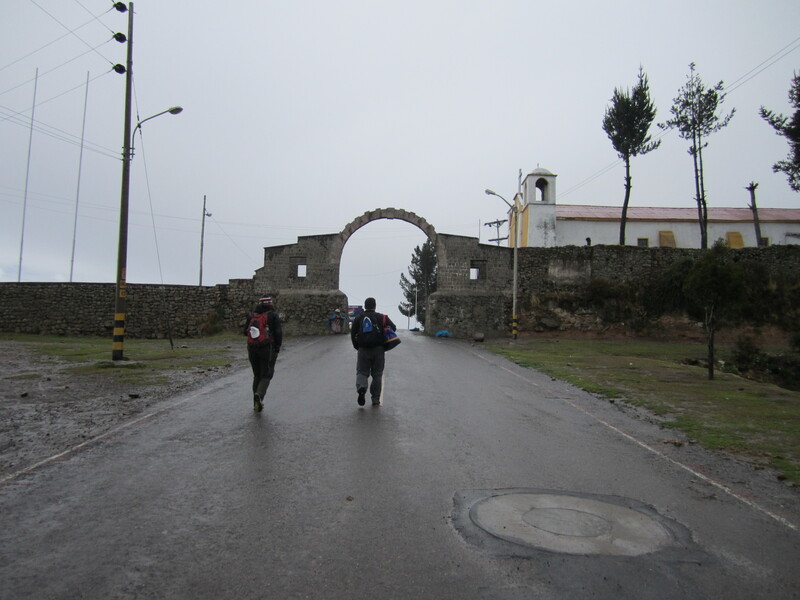 We rolled into Copacabana after a wet border crossing from Puno, Peru. The entry process was the easiest one yet, we just had to fill out some paperwork, pay some money (Americans have to pay $135 for a 5 year visa) and “we… are… in.” The bus even waited for everyone to get stamped in. Easy peasy. Joe and Tee Crossing the border - Trying to make a break for it. 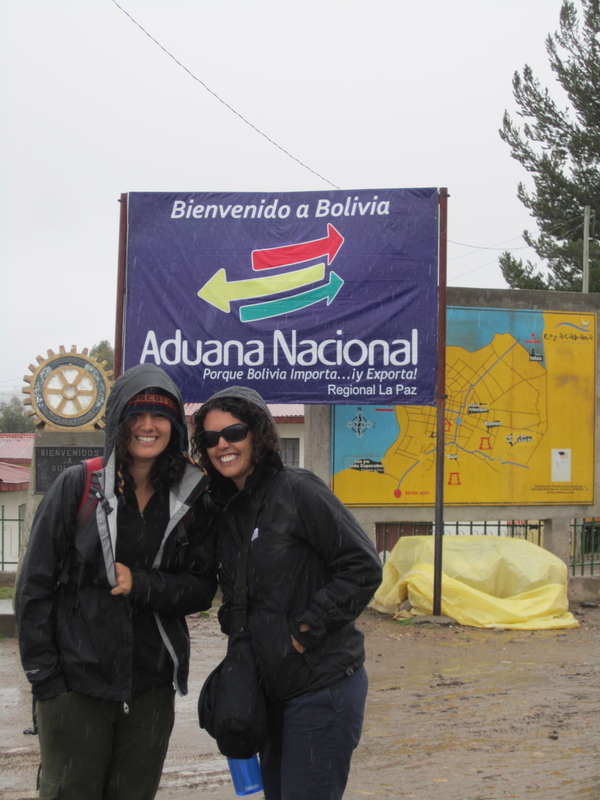 We're in Bolivia... and we're soaked. 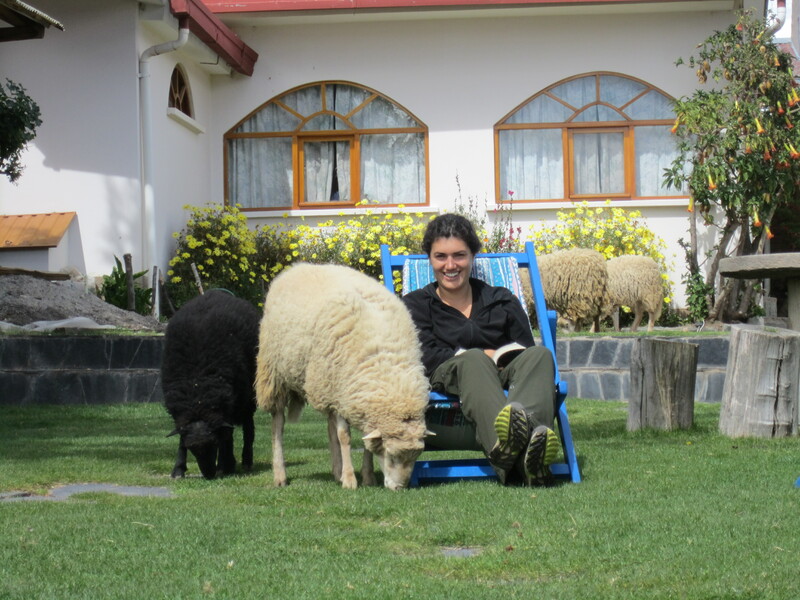 Before we came to Bolivia, one of our hostel owners told us Copacabana is best described as a “failed hippy town.” We didn’t exactly know what that meant until we arrived. After just walking around for a few minutes, we agreed with her assessment. The city had a weird vibe: super touristy, young foreigners selling trinkets or juggling for money, and every third one seemed to have a bongo drum or dreadlocks (often a combination of both). Unlike a “successful” hippie town, this place didn’t feel too peaceful or relaxing. Our first taste of the town was not a great one, but luckily things improved when we got to our amazing hostel and room. 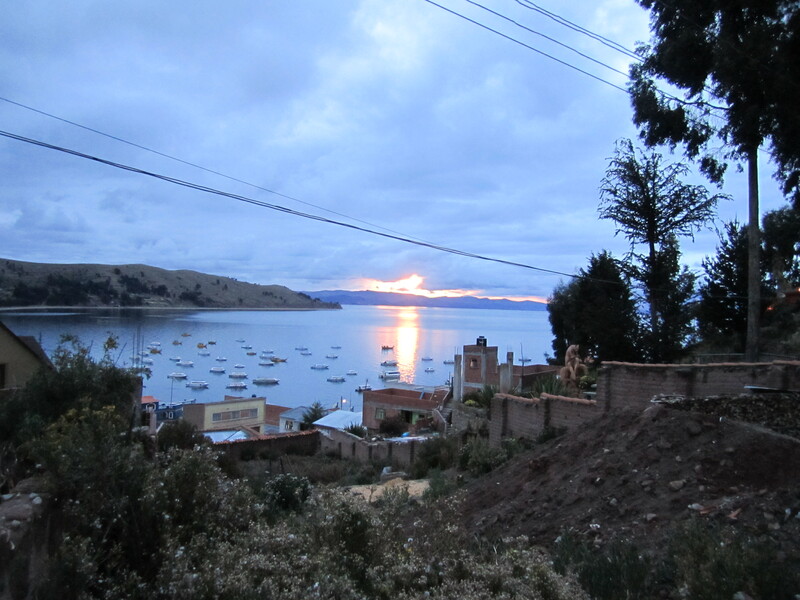 We stayed at La Culpula, which sits on the hillside overlooking Lake Titicaca, and our room was equipped with a fireplace and great little kitchen (we were excited to cook our own meals for a change). 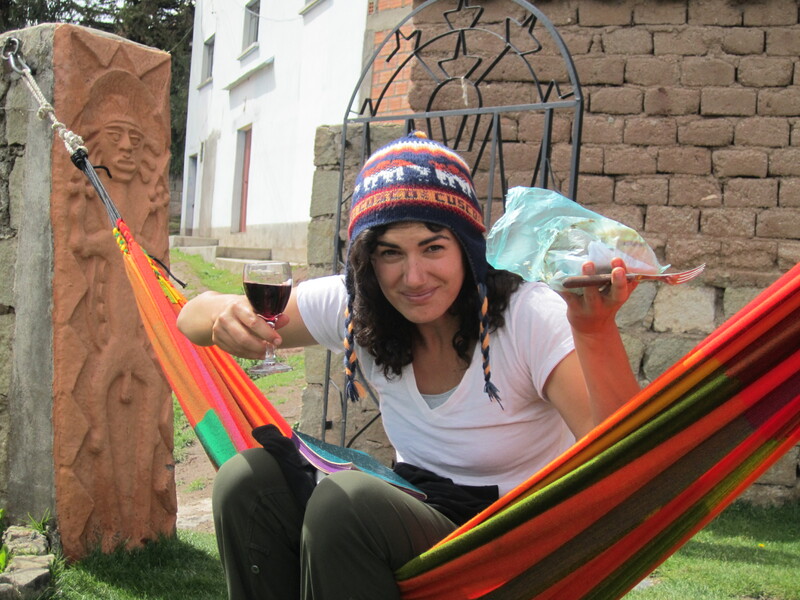 The grounds of the hostel were filled with hammocks and sitting areas, all with great views. Wine and cake in a bag, the lunch of champions! We settled into our new surroundings and quickly forgot about our initial bad taste. 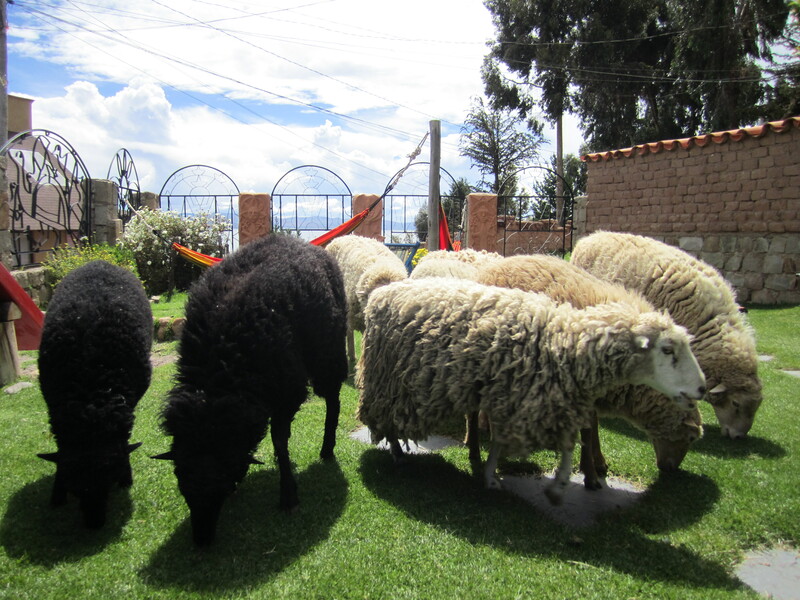 At one point the lawn cutting crew came through to take care of the grass. Turns out this was not as disruptive as we thought it might be, and honestly they couldn’t even care if we were there or not. 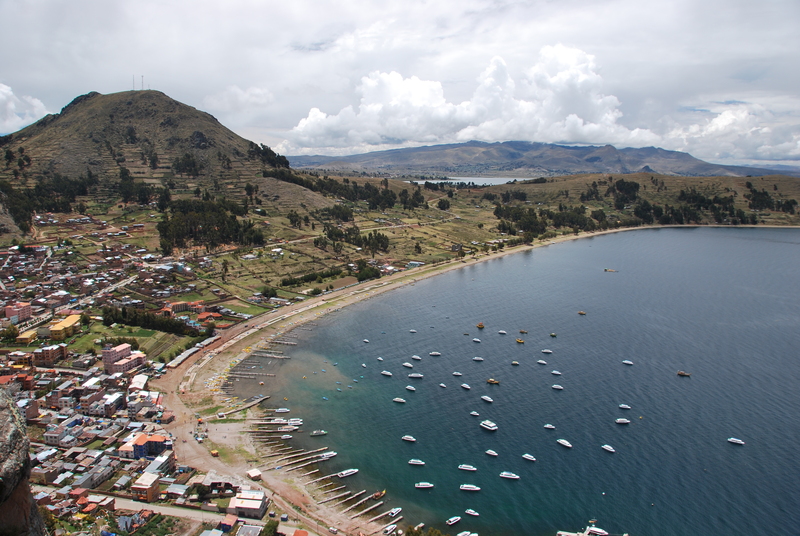 The town of Copacabana sits on the shores of Lake Titicaca, the world’s highest navigable lake at over 12,500 feet. Once again, anytime we walked anywhere, we were reminded of the altitude. The town really does not have too much to do, so we spent most of our time simply relaxing after traveling hard over the last few weeks. 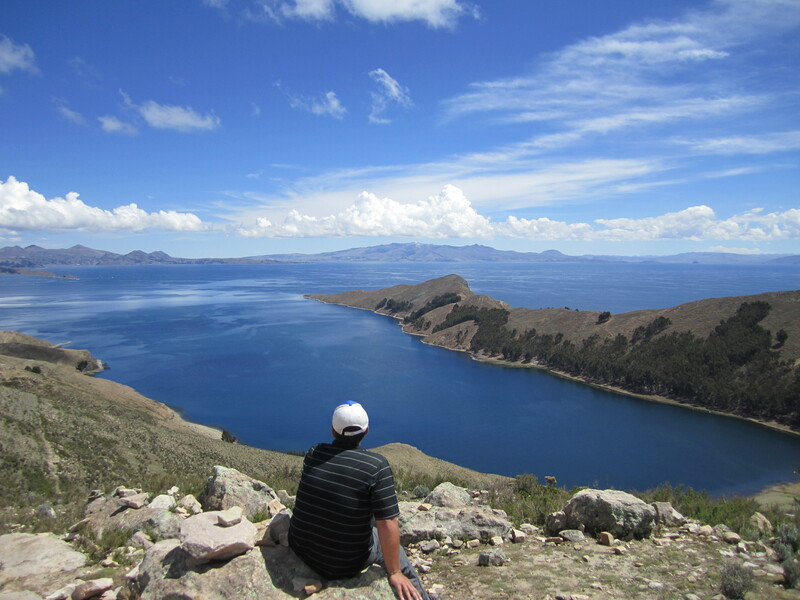 We did take one quick hike up a hill to a lookout for the lake view and get a look at our next destination, Isla del Sol. Joe was so happy to see the world’s highest navigable waterway that he could barely stay on the ground. Jumping Joe - Just trying to figure how to get his ship up here. 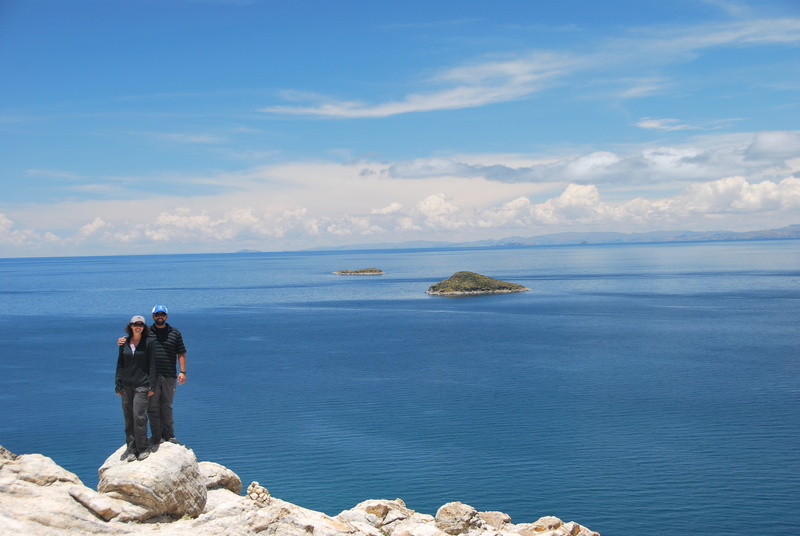 We decided to head out to Isla del Sol for an overnight trip and to hike the island. 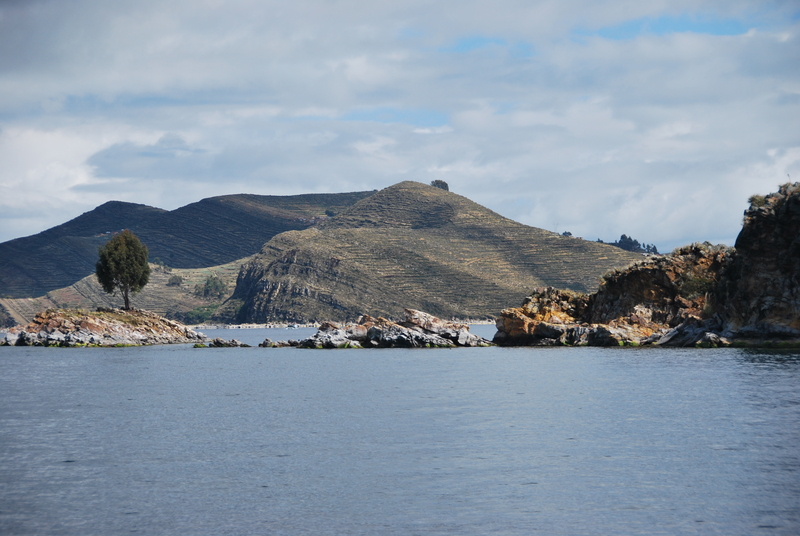 This island was very important to the Incan culture, as this is where they believed their gods came from. 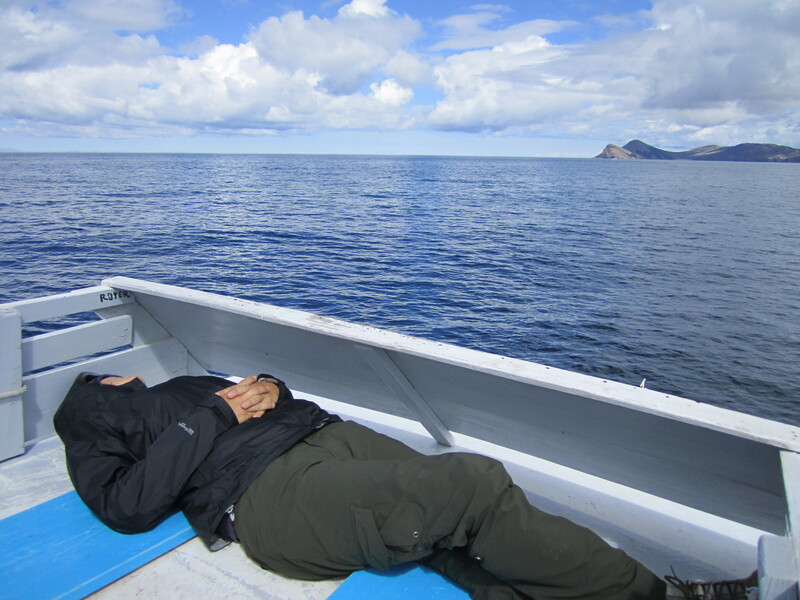 We took the slowest ferry in the world (It took almost 3 hours to do a trip that could be done in 30 minutes with a better boat) to the north part of the island where our 3 hour hike would start. 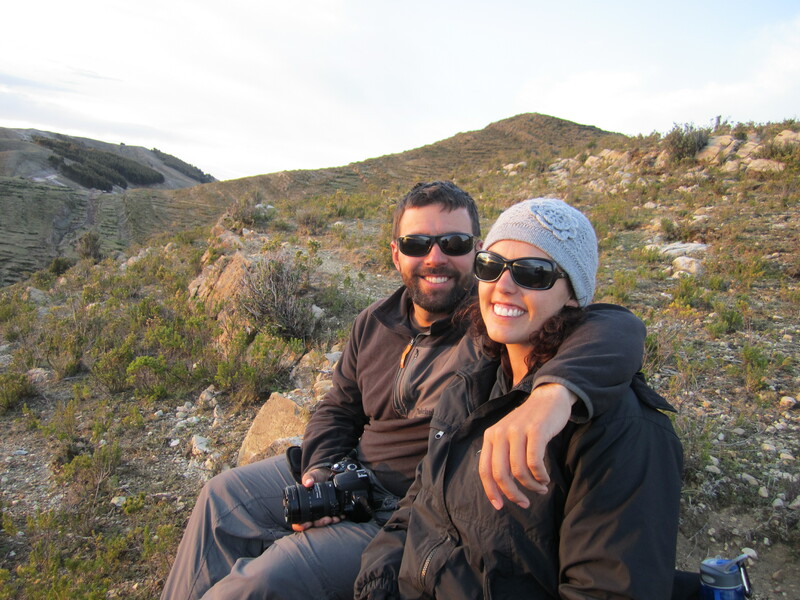 With the adrenaline still pumping from the fast ferry ride, we started our hike around the island, and again Tee could barely contain her excitement. 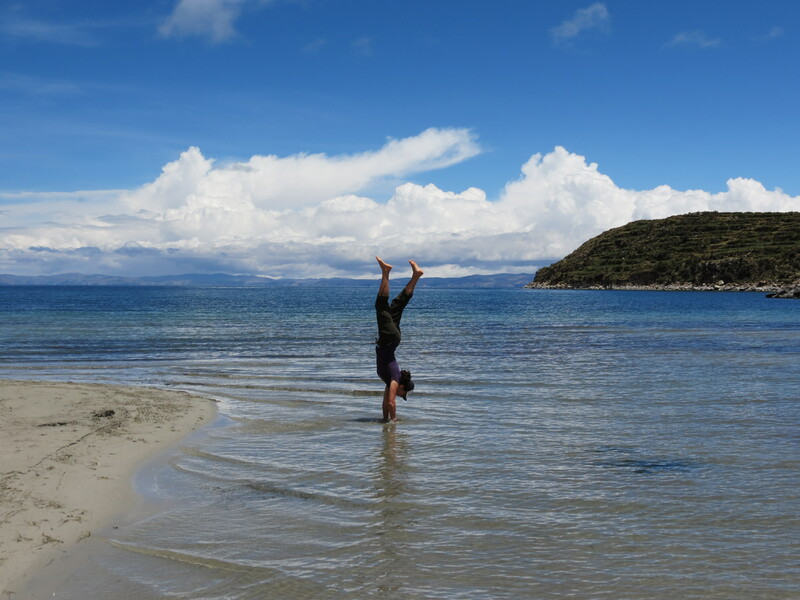 The water and scenery were so spectacular that our cameras barely got a break. The island is very beautiful, and it reminded us of islands in the Mediterranean with their blue waters and rocky shores. Amazing views at every turn! 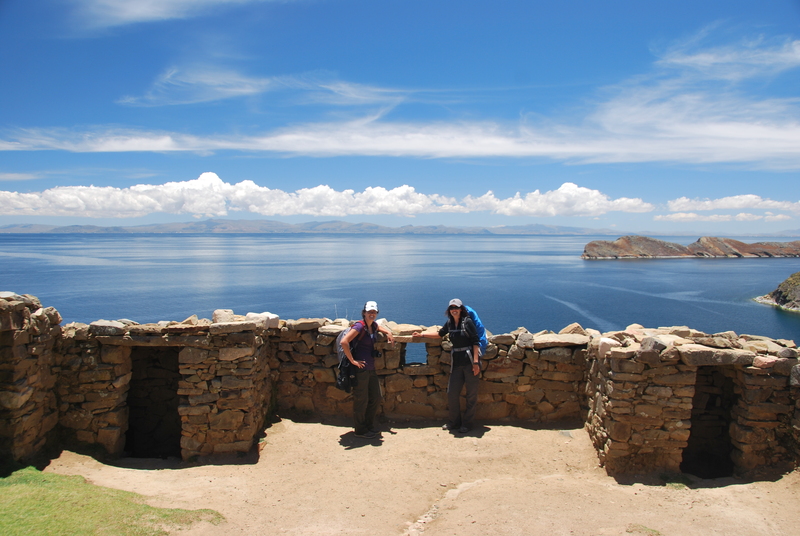 The island has a few Incan ruins and we were able to explore some of them out along our hike. One we visited was called the Labyrinth, and it lived up to its name with its many narrow walkways and dead ends. 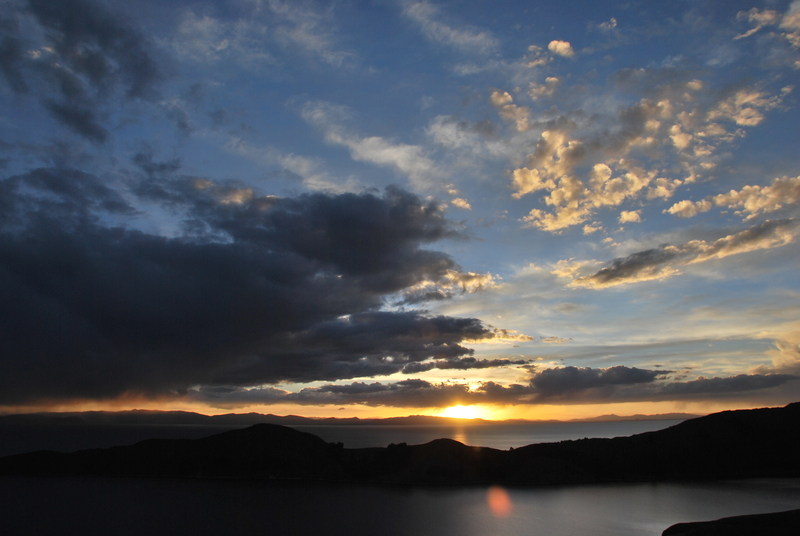 We stayed at a great hostel high above the water and we were treated to an amazing sunset. 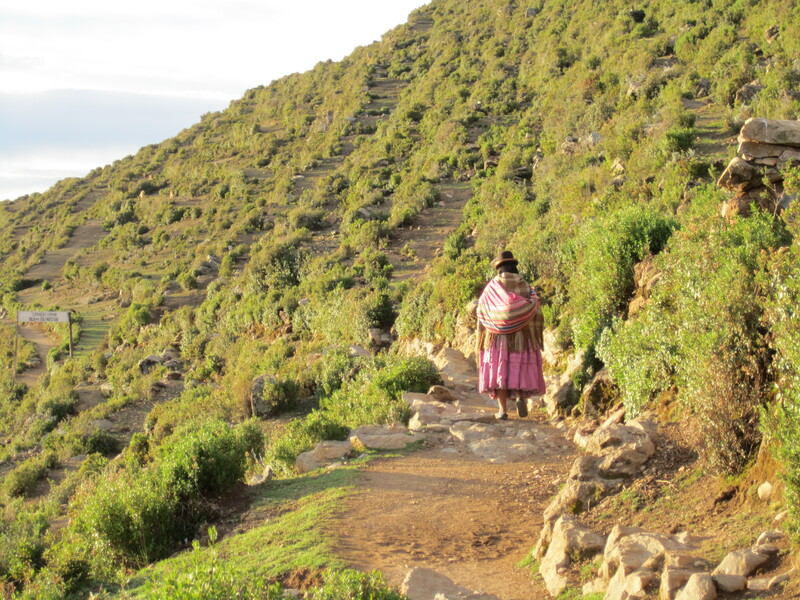 This whole area of Bolivia is peppered with amazing mountain ranges that race into the sky. 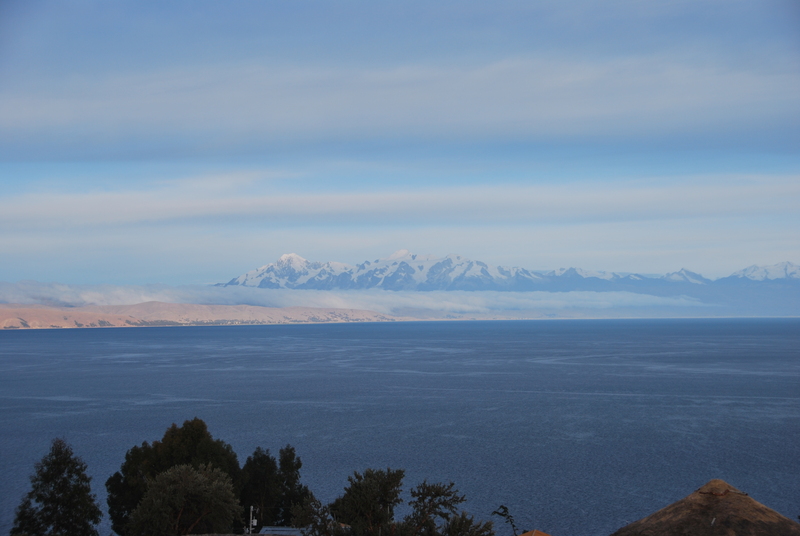 Luckily, it was clear enough to see one of these ranges from Isla del Sol. 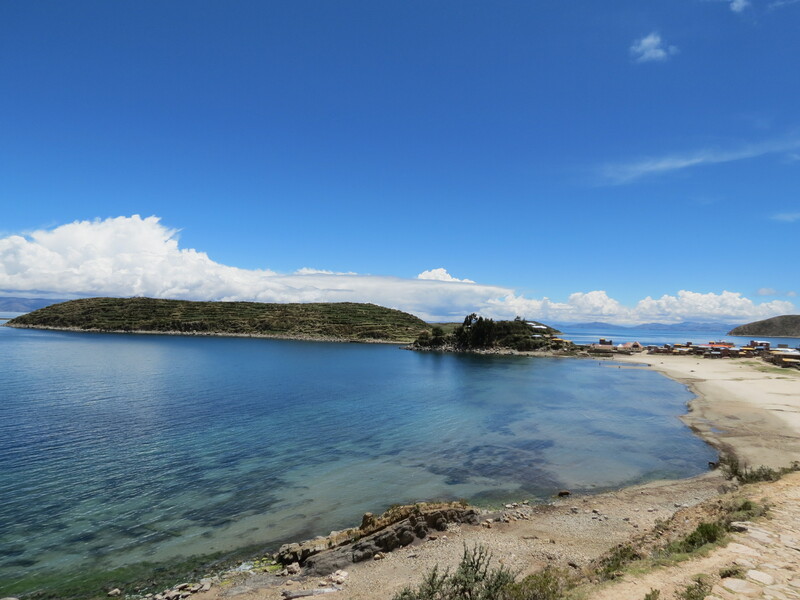 Isla del Sol was a highlight of our trip to the Copacabana area, the island has a really cool small town feel while being easy to explore as a tourist. Everyone would say hello as we walked around and they seemed happy to share their beautiful island with us. 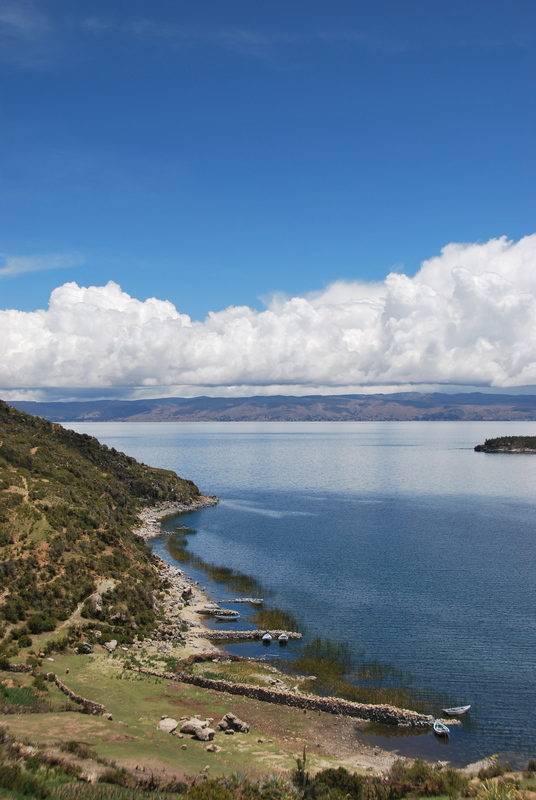 If you are ever headed out this way, we recommend that you spend more time relaxing on Isla del Sol than in the odd town of Copacabana. 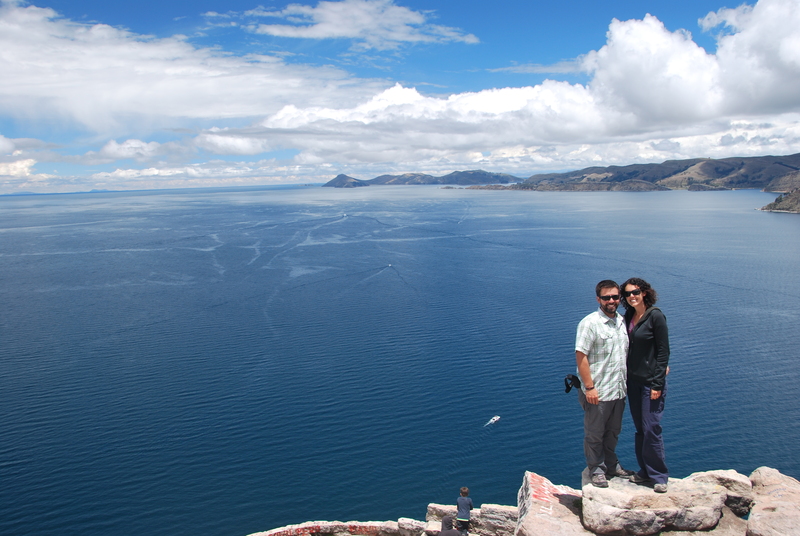 After one night, we left the sleepy island of a few thousand and headed to the insane hustle and bustle of La Paz, Bolivia’s capital. 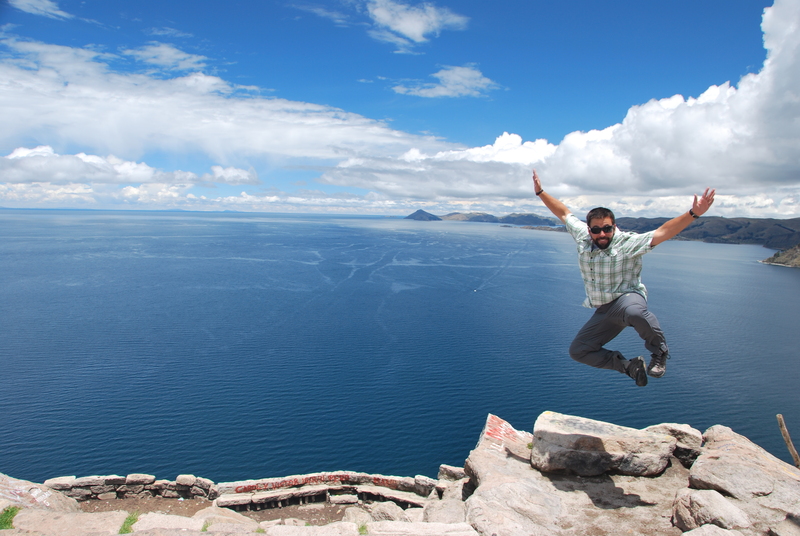 This entry was posted in Bolivia and tagged bolivia, copacabana, hippie, isla del sol, lake titicaca. Bookmark the permalink. Oh, memories. Copacabana looked nicer than I remember it being– maybe because the photos were of the good views and far out of the town. 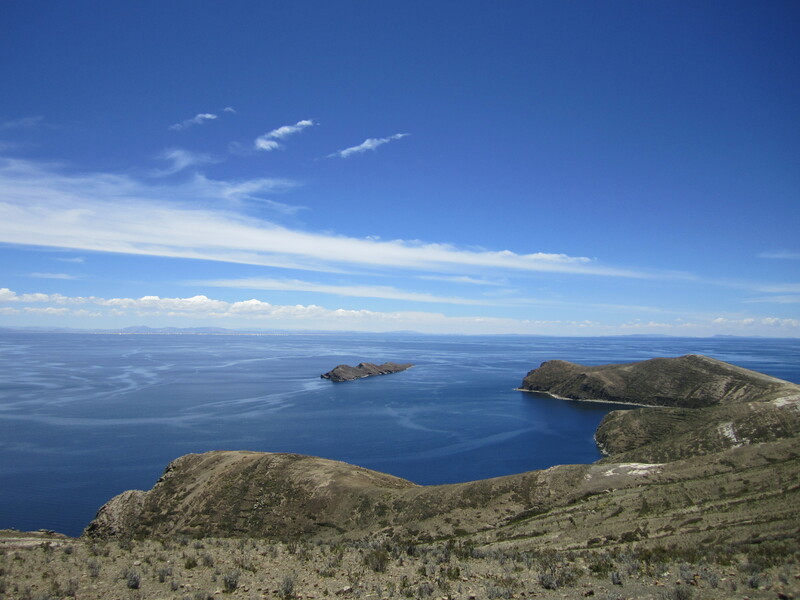 And Isla del Sol. What a great island. And I agree with your sunblock statement too– I got burned on the right side of my body so much that three people have pointed out my uneven tanline. Just remember who said it first. Photos and view are magnificance.